[MOMENT] is a particular point in time, an indefinitely short time, here and now, at this time, a minute portion or point of time dedicated to fashion, art & music. [MOMENT] is organized as an alternative to traditional fashion shows, where costumes are shown by models walking on the catwalk. 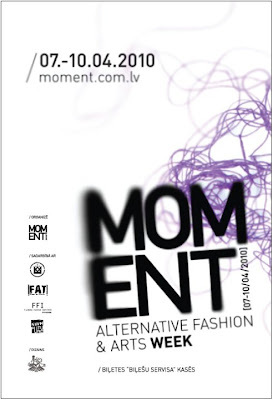 [MOMENT] intends to set or stage alongside the Latvian artists other international artists to demonstrate that Latvia has its place in the world of fashion, music & art.